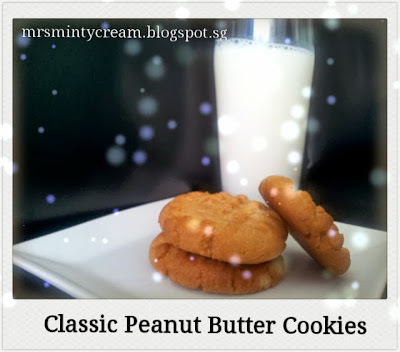 For a peanuts lover like my hubby, it is strange to me that his special liking for creamy peanut butter is not extended to its chunky counterpart. Hmmm.. So, I began thinking about what can I do with the bottle of chunky peanut butter in the cupboard which Hubby hates? Not only so, last week I also met up with my BFF, Cynthia. Knowing that she must be totally stressed up over her work in school (with the marking of coursework & preparation of End of Year Exams), I wanted to bake her something to cheer her up. 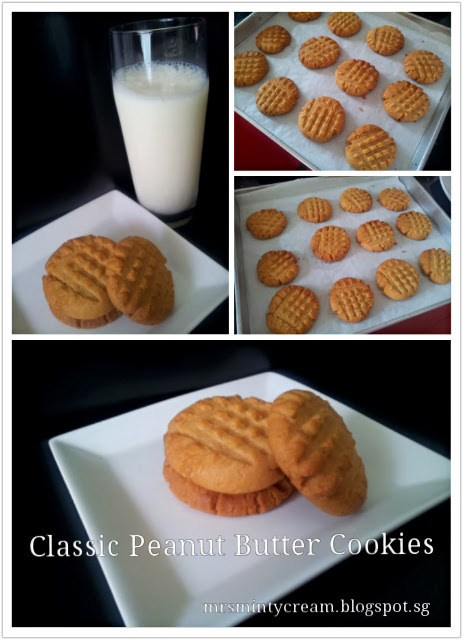 So Classic Peanut Butter Cookies it shall be! Personally, I really like the combination of a couple of Peanut Butter Cookies with a glass of iced cold milk. Perfect! This version of Classic Peanut Butter Cookies I had made is not the chewy kind. But instead, expect the crispiness of a cookie combined with a thick creamy taste of peanut butter. If you are a lover for peanuts, I see no reasons why you wouldn't like this. Cynthia seemed happy with the cookies, so am i! 3. Combined the flour, baking soda and salt in a mixing bowl. Sift the flour mixture and set it aside. 4. In the bowl of a stand mixer, cream together butter with the fine sugar and brown sugar with the electric mixer. Do this for at least 3 to 4 minutes to ensure a good mix. 5. Add egg, vanilla extract and peanut butter into the mixture and mix until smooth. 6. Add the dry ingredient (flour mixture) slowly, spoonful by spoonful, and mix well to ensure that all the ingredients are well-incorporated. 8. When the dough has set well, use a small ice-cream scoop to divide the dough into small portions (ball-shaped) and place them on the baking trays. Ensure that they are at least 3 to 5cm apart from one another. Also flatten each of them with the back of a fork to obtain a crisscross pattern on each small cookie dough. 9. Bake for 12-15minutes, until the edges of the cookies start to turn golden brown. 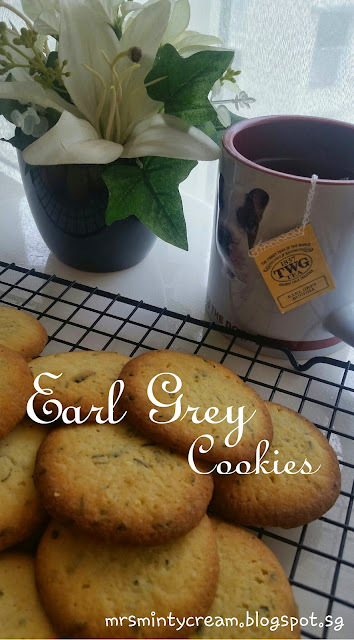 Allows the cookies to cool on the baking trays for about 5 minutes before transferring them to a cooling rack to cool completely before serving.